Edited once, last by sitenoise ( Mar 27th 2018 ). Is Miyu Nagaoka back from her seemingly endless hiatus already? I miss watching her in the NT. I thought Mari Horikawa would be a good sub for her in the coming years. Is she underperforming in the V-League this season? Libero: Miku Torigoe retired and Arisa Sato never got called up. I was satisfied with the Kobata receiving/Inoue defense duo. Inoue really impressed in 2017. I wouldn't cry too loud if Nakada sticks with them, although I'll cry a thousand tears for Arisa Sato. Inoue is quick as lightning, but Sato is better at block coverage and skating to where the puck is going to be--which makes her a net positive for me. If I had to pick someone new to join the ranks it would be Toray #15 Yumi Nakagawa. She's a commando, fast and smart, with soft arms. Setter: Tominaga was a revelation in 2017. Miya Sato should retire, black hole of defense that she is. The Miyashita Mystery: was it poor setting or arthritic knees that kept her out in 2017? She's one of the best floor defenders in the world. I would love to see her back. Misaki Tanaka is nothing to write home about. If I had to pick someone new to join the ranks it would be Toyota's #4 Momoko Higane. Great floor leadership and she makes a good set from a bad pass look easy. And Denso's My Little Sweet Pea because she's young. If I had to pick someone new to join the ranks it would be JT #1 Aika Akutagawa. Fact. Start with OPs -- If Miyu Nagaoka is back and healthy I imagine the job is hers. She's the best outright hitter in Japan, but she's got nothing else. It is invaluable, though, to have a real threat on the right side to keep the defense honest and make the job for the rest of the front line easier. Shinnabe doesn't get the respect she deserves as an OP hitter. She's freakin great, maybe she lacks the stamina to swing 40+ times. Her reception is world class. Nomoto is a serviceable OP when the rotation calls for it. She's lucky she hits the 180cm mark, has a connection to Nakada and seems mature, because there are many swingers who could replace her. If Nagaoka returns, Horikawa is gone. Yuki Ishii - world class but better watch her attitude. Unfortunately she has no leadership qualities. She doesn't make those around her any better except by giving them good passes. Japan will never win an international tournament with her as their best player. Sarina Koga - time for her to grow up and show some leadership. She hasn't improved in three years as a hitter, but she's at Yuki/Risa level reception, and she's a great back row defender ... with flashes of blockage chops from time to time. Mami Uchiseto, a coach's favorite who receives really well. I wish I liked her. 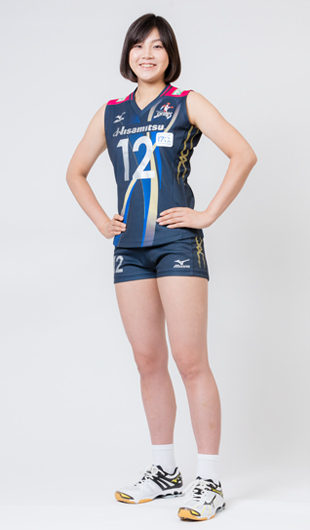 Yurie Nabeya, imo, the most improved and improving player of the stars. It's just weird she doesn't seem capable of playing a whole game from start to finish. Invaluable off the bench. I hope she is happy with that because she's great at it, and J-NT needs it. Risa Ishii, I dunno. She's pretty good as a MB/OP dualist but only 179cm, non-receiving. Expendable. Saori Takahashi, I wish I wish. She's the closest I've seen to the sorely missed explosive athleticism of the dearly departed Saori Sakoda. But she doesn't hit from OP like Sakoda. Receives OK. Expendable, sadly. Mizuki Tanaka, I don't think she did anything for JT this year. I like her more than Uchiseto, but I'm wrong. Expendable. Love, After Dark (aka Ai Kurogo) - She's not ready for the big leagues but maybe she's one of those that needs to be thrown in the pool before she learns to swim. She's a receiving machine, but she needs to cut way way back on service errors. As a hitter she looks like a one-shot wonder to me. She could learn a thing or six from Koga, or Nabeya. Might be good for her growth to start playing with them. Arisa Inoue - 22 year old #22 Arisa Inoue, in her first game for Hisamitsu, a Final 6 game, went 42/20 in attack, with 1 block, 1 Ace, and she made 1 error. Aged 22, number 22, scored 22 points in her first game. Based on that I'd start her in the WCh, but that's the only time I've seen her play. I'll relax for now and keep an eye on her. A shout out to Hisamitsu's #12 Yuka Imamura (OH) and NEC's #8 Mizuki Yanagita (OH/OP). As hitters they are both NT worthy, but neither of them receives, so they will never make it. Imamura was probably the most solid and consistent OH I witnessed across all teams this past season. She had a better attack percentage than Yuki or Risa, took more swings than Risa but played too few sets so she doesn't show up in leader boards (I guess?). After Yanagita gave up the shakes of being Captain and just played volleyball she rocked it. She swings like Risa but can jump higher and hit harder. Too bad receiving is not a strong point, but when she was tasked with it during Yamauchi's injury she knocked on the 50% door. I watched most every V.League game that was played this season, except Ageo games. Beyond Imamura and Yanagita, and possibly NEC's Misaki Yamauchi, I didn't see any 'established' players I would consider calling up. I did like Hitachi's Megumi Kurihara and Denso's Mizuho Ishida (C) a lot, but they are too old. Nanaka Sakamoto - I have a sneaky feeling that she is liked by coaches. She's an average OH who receives well enough. I like that when push comes to shove she doesn't back down, but she seems lazy to me. If you want to ace her serve to her chest high or above. Miwako Osanai - She shouldered the scoring load for Hitachi--such that it was--has great energy and receives well enough. Her problem is confidence. If she gets blocked she'll hit the next one out of bounds. I'd get her on the team right away. Yuka Meguro - Solid all around player who can beast it, almost. She joined JT mid-season and put Kanasugi and Kitsui on the bench. She's playing in the Finals, not them. Doesn't seem like NT material, though. Rei Kudo, Marvel Comics Superhero - Didn't get to see enough of her but what I saw I really liked. Good receiving OH with an agressive "Give me the ball" attitude. Shiori Aratani - Oops, scratch that. I like her but she's got to prove herself more. That will be hard on NEC. Nagaoka didn't play at all. Word was she might be ready to return about this time but the season is over--except one more Final game. So, don't really know her status. Horikawa was a monster early in the season and tapered off. If Nagaoka remains out, Horikawa is a good sub. If Nagaoka is back partial or full time, I think Yanagita is a better backup--better overall skill set and floor fun, but I'm biased. I have always liked Yanagita. She's really short, though. Ohtake had a knee injury as has been working her way back from that. Miyashita cried tears last year as the Seagulls dropped to the second level. Team won the second level and will be in the new version of the V. league top level. Horikawa is left handed and that will keep her on the squad or at least the large roster. Sakoda retired last year and has already started broadcasting high school matches. Kurogo is expected to be the next big star, but still has a ways to go. Might get some time in VNL this year, but maybe not World Champs. Uchiseto will probably get some run from Nakata due To Nakata’s Italy coaching experience. While she was in A2, still may be a higher level of volleyball than V.League. Missing Ebata, Airi Miyabe, Ishikawa (Yuki’s sister) and others too. I didn't get a chance to see Ebata play this year. I wonder how she's doing. I thought Miyabe moved to Idaho or somewhere, to go to college and play for a university team. I've never seen Ishikawa play. I don't think. It's Miyu? Seems the J-NT should start including some youngsters to grow for the 2020 show. I don't know how to judge them when I can't see them play. You know me, I can't pick someone based on numbers, so I'm just looking at the few who've gotten a little playing in the V.League. That's unfortunate that Nagaoka's still out. How long has it been? I counted wrong and still have two open spots on the roster, so I'm bringing back Haruyo Shimamura (MB) and Saori Takahashi (OH), unless brahmin has a couple youngsters I should consider. Is Yukiko Ebata still playing? She played in the Challenge League this past season, for the PFU Bobcats, so we didn't get to see her play. "Yukiko also said that she doesn't like participating in the practice of her team during the service reception and defense so she is often exempt." Is she retired from the NT? I always thought Manabe's beef with certain players prevented Japan from doing better after 2012 Olympics. Ebata had an injury that kept her out of 2014. He wanted her but she wasn’t physically up to it. Since then she’s been on the outside looking in. As an opposite, she really really never passed in Japan. In France, the shifted to an outside hitter with passing, but usually was not a starter. So informative -- and your posts always look so nice! The best libero in the world has not been invited to the NT (although it could be her decision for all we know), and her club team is at risk of being demoted to Challenge League (although with changes to the League next year I'm not sure how that will play out). Hitachi will not be relegated because they have passed standards for V1 and the last team to pass certification were in Challenge 2 League. Imamura was probably the most solid and consistent OH I witnessed across all teams this past season. According to her V.League profile page, this was essentially Yuka Imamura's first season of playing time for Hisamitsu. She was rostered for the two previous seasons but took ZERO swings. Yuki and Risa contribute so much more to the team than swings, I know. Edited 2 times, last by sitenoise ( Apr 12th 2018 ).